John, Shelly and the Creatures is not John Shelly and the Creatures. There’s no John Shelly. Actually, I’m not sure if there’s a John or a Shelly either. I definitely don’t see it in the band lineup, but rumour has it, they’re in Berlin somewhere. Anyhow, John, Shelly & the Creatures are the best band to come out of Northern Ireland this year (and that includes Two Door Cinema Club). 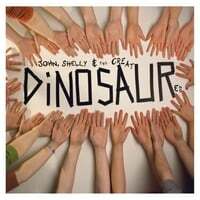 Their debut album Dinosaur has just been self-released, and is highly worth checking out. It’s a breezy pop album, with fantastic instrumentation throughout. The piano on ‘Cold War’ is glorious, and the vocals on opener ‘Blinded and Cross’ are hugely uplifting. The vocals on the whole album really soar, and the harmonies on some of the tracks are almost Byrdsian. Dinosaur is not a rock album the way Tourist History is, but rather a melodic pop record, with great melodies and fantastic hooks. ‘Sunny Side Street’ is the perfect example of this. It’s not all straightforward pop though, as demonstrated by the slow-burning, pedal-steel led ‘Sight of Your Chest’ (performed by guest Stuart Bell). Maybe the Irish alt-country movement may be set to arrive! You may already recognise ‘Long May You Reign’, as it was featured on the Discover Northern Ireland adverts. A great selection, but there are loads of fantastic songs here which are sure to get airplay – such as ‘Rust’, ‘Marley Street’ and ‘Killer’. The latter especially. It’s the album’s highpoint and an utterly gorgeous rock song. Destined to be a hit. Overall, it’s a very impressive debut, and a quite cohesive record. Impressive from start to finish, this is the beginning of something good.